A top producer for professional anglers this 3/4 ounce, 7/8 inch wide by 4 inch long fishing spoon with Fire Fly® glow in the dark technology glows bright green longer for more fish in low light or stained water conditions. 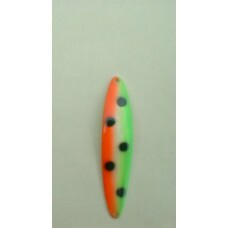 This fishing lure is heavy weight and very durable. The design gives a tight vibrating action calling fish from long distances. It trolls well at slow or fast speeds. The 3/4-ounce weight will cast a long way. Anglers use them for trolling, casting or jigging. Razor sharp hooks are included to help you catch limits in salt water and fresh water.